The electricity grid that serves most of Texas hit an all-time record for demand last Thursday, topping out at 73,259 megawatts between 4 p.m. and 5 p.m. The record may not stand for long, as hot conditions continue. The heat is causing hardship across the state and the country, and also providing lessons for the people who manage the grid and make energy policy. Texas leads the nation in wind energy. Meanwhile, the state has seen a wave of coal-plant closings, as the plants cannot compete with less expensive power from renewables and natural gas. Supporters of coal power have long said that renewables are not reliable enough, and they said their point would be proved in a crisis, be it a heat wave or a winter storm. Now, the crisis is here, and so far Texas’s grid is holding up fine. To understand what’s happening, I spoke with Michael Webber, an engineering professor who is deputy director of the Energy Institute at the University of Texas at Austin. As we get into the day-to-day battle to deal with high electricity demand, one of the key considerations is how much wind is blowing. The grid manager does a daily wind forecast to help plan for what other resources may be needed. The wind has been strong during times of peak demand in South Texas, Webber said. At the same time, West Texas has been less windy, as the hot conditions lead to stagnant air, he said. The grid is run by the Electricity Reliability Council of Texas, or ERCOT, and its planning for the heat can serve as a model, Webber said. The council said in April that it expected record-breaking demand and laid out the steps it would use to keep the system running under high stress. One of the strategies is maintaining a reserve margin, which means that there is electricity available that exceeds the forecasted demand. ERCOT set its reserve margin at 11 percent. 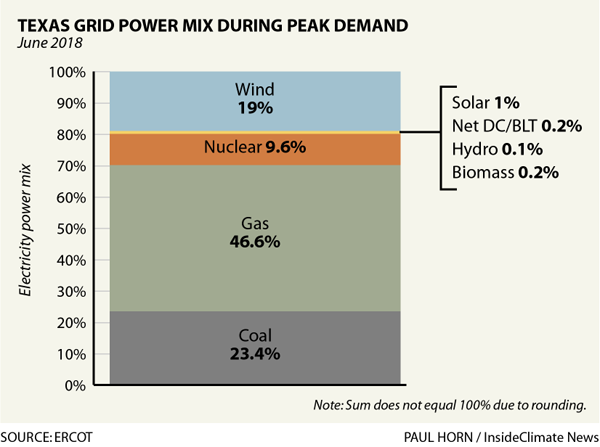 Here was ERCOT’s power mix last month: Natural gas was the leader with 47 percent (including combined-cycle gas plants and single-cycle ones), followed by coal with 23 percent, wind with 19 percent and nuclear with 9 percent. Solar was way down the list at 0.98 percent. If the state makes it through the summer without blackouts, then supporters of wind energy will have a reliability argument that they can make, in addition to the economic one that they already have. A real “fart in church” (sorry, couldn’t resist) is the combined total of 70% for natural gas and coal in a state that “leads the nation in wind energy”. And after a “wave of coal plant closings” they’re still at 23.4% for coal? And most coal is being replaced by natural gas? How slow do things have to move before we stop calling it progress?